If it has has to do with your septic system, we do it. With our septic system designing services, we design custom septic systems for commercial, residential, and industrial spaces. Once your design is complete, we will implement it into formal site plans and meet with local officials to obtain all necessary building and installation permits. With this, we also provide complete excavation, restoration, and covering services. 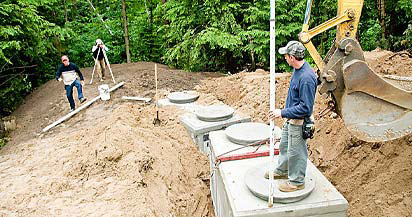 We offer complete installation services for septic systems and leach fields. Before beginning the installation process, we’ll meet with you to determine a service date, and create blue prints of your tank and property. We’ll meet with city officials to review these prints and follow with the installation process. Contact us today to learn more about any of our septic system services! Greg's Septic System saved us from having no septic system at all during the harsh, never-ending winter of 2015. We began to have problems in late December and our regular septic system company came out and analyzed the problem: that our system was frozen up. They said we needed to wait for the system to thaw. After a few weeks of deteriorating weather and using our system as little as possible (getting my hair washed at a beauty parlor, using paper plates, "bathing" in our hot tub) we thought there must be SOME way to get this fixed without waiting for a spring thaw. We called Greg's Septic System and they quickly showed up and FIXED the problem, digging up our yard (judiciously with the help of our septic system plans) till they found where things were frozen and cleared it out. What a relief! We had a consult this spring to see what we should do to make sure we never had the freezing problem again and we, with Greg, decided that we were going to just "wait and see" because we'd never had a problem for 16 years and maybe it was just the cold, cold winter we had had. He could have sold us anything at that point but most importantly, he sold us his trust.